With many years experience in the wedding and craft business, Made2Matter provide quality handmade award winning wedding stationery, Venue Styling/ Event Dressing and accessories. These include Chair cover hire, Wishing Tree, Table decorations, Crystal Bouquets, table plans, fascinators. 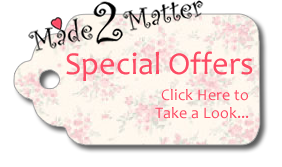 Made2Matter also provide handmade and personalised special occasion gifts, from new born babies to 50th wedding anniversaries to customers throughout Tyne and Wear, Durham, Cumbria and Northumberland. Established in 2007, the business is situated in South Shields within the North East of England. Made2Matter offers a range of unique designs with coordinating accessories that are designed to reflect style and character of each individual customer. Using only the best quality products, the experienced staff will make the occasion that little extra special with a personal touch. Wedding invitation designs, will be made to match your colour scheme and theme. The favours and other accessories are handmade to perfectly coordinate with the chosen theme. Invitations for any occasion are made 2 order. The products are tailored to individual needs and adds an extra touch of class to any occasion.